'Lady Middleton's pattern' is a key to revealing a whole web of relationships within a group of neighbours and relatives in East Sussex. Lady Middleton was born Frances Pelham, the daughter of the 1st Earl of Chichester, of Stanmer Park near Brighton. She married in 1778 and died in childbirth in 1783. Her sister Emily is also mentioned in the inscriptions. Another sister, Lucy, married the 1st Earl of Sheffield, of nearby Sheffield Place, in 1794. Lucy's stepdaughter, Maria Josepha Holroyd, is also named on the patterns and was a friend of Miss Thrale. 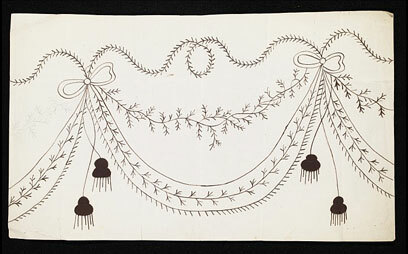 It is clear from the inscriptions that these women were willing to share an embroidery design with a friend or relative. 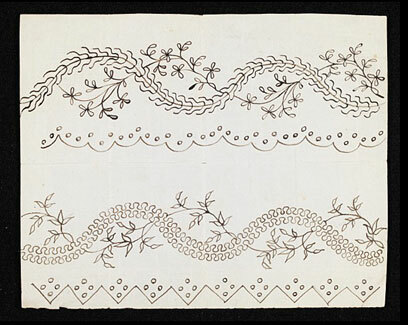 Design for embroidery for a petticoat and open gown, 1782–94. Museum no. E.237-1973. 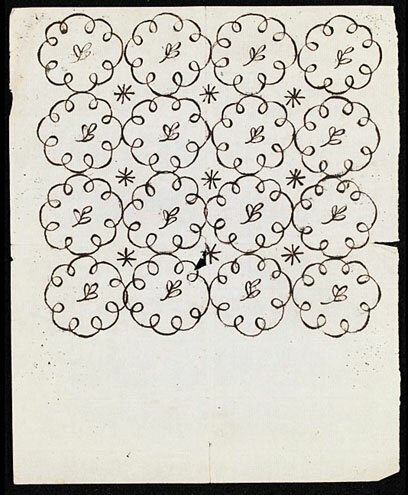 The pinholes, not following the lines of the design but scattered all over the sheet, suggest that the design was once pinned to a piece of muslin or gauze on a round tambour frame. 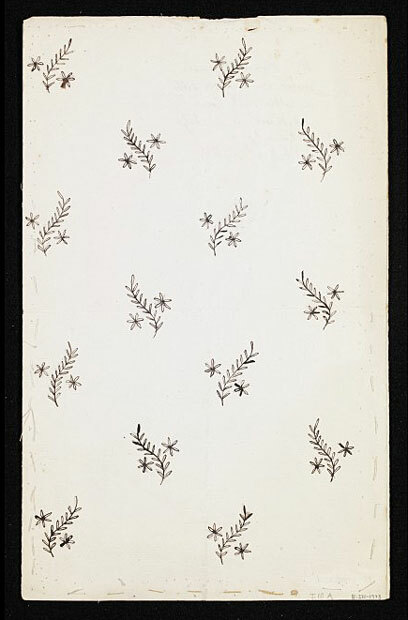 The vertical design is similar to that on a white muslin gown of about 1800 displayed in the British Galleries (Room 120). Miss Thrale was Hester Thrale (1764–1857), known as ‘Queeney’. Her father was a wealthy brewer and her mother the celebrated and clever Mrs Thrale, a friend of Dr Samuel Johnson, the author and lexicographer. 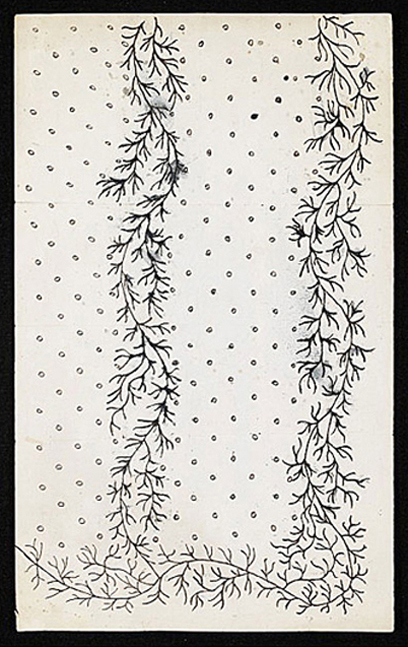 The similarity of the seaweed-like pattern on this design and that for Miss Thrale's apron shows that one pattern-drawer, or perhaps an assistant in the same workshop, designed both. The front edge of the paper has been sewn onto a backing sheet to strengthen it. This, and the many pinholes, suggests that the design must have been used many times. The grid of pinholes shows how the design was tacked to muslin or gauze on a tambour frame. This design closely resembles another in the London archive. Presumably both are the work of the same pattern drawer. 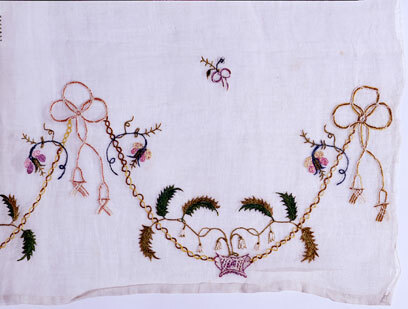 The inscription may suggest that Mrs Henry Foster was a professional embroiderer, and that the workshop was noting the technique used by one employee to instruct another. Alternatively, it may mean that she was an amateur who had once hired the pattern, and that it was now on loan to someone else who needed further guidance. There are two designs on this sheet of paper arranged with one at each end. The borders are for the right-angled corners of aprons with scalloped edges. The design is unfinished at one end but the repeat indicates that it continues to the borderless edge. 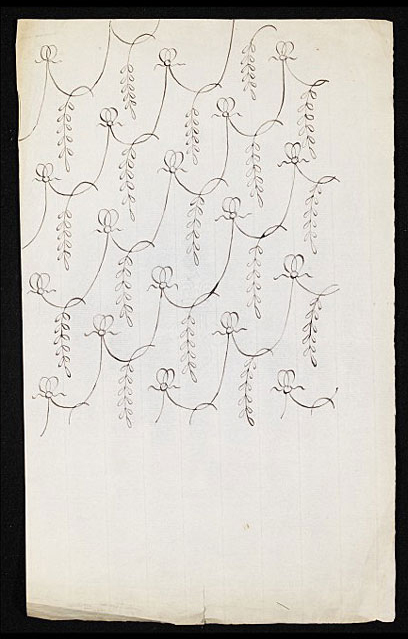 The skilful drawing of the repeat suggests that the design is the work of a professional pattern drawer. 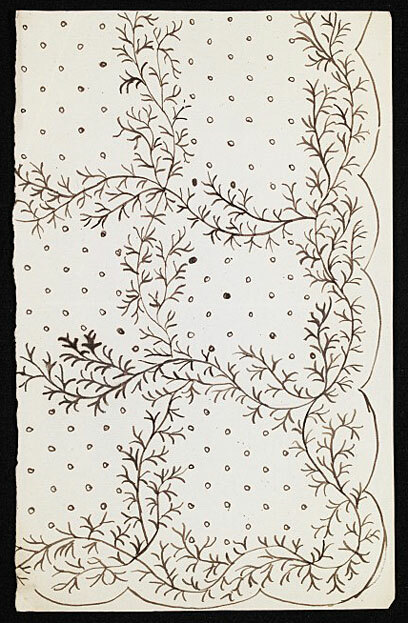 The undulating stem with leaves along the top of the design is similar to one published in 'The Fashionable Magazine' (‘Pattern for a Train, Drawn by Mr Styart’, plate iv, vol. 1, 1786). 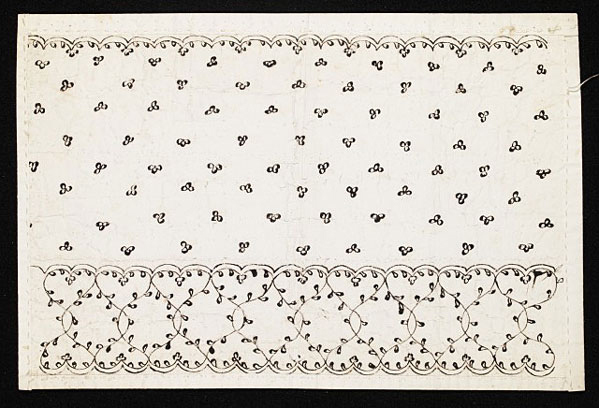 According to Saint-Aubin who described whitework embroidery in his 'L'Art du Brodeur', published in 1770, the design was never drawn directly onto the material but 'with small stitches one bastes the muslin over the design which has been drawn on paper or parchment.' The embroiderer could then work directly from the design beneath. 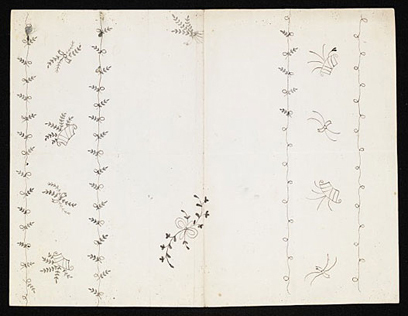 In some cases, these designs could have been embroidered professionally for the clients as a ready-made dress. The patterns have a client's name instead of a number for cross-reference with a client book. This numberless system suggests a business with an easily identifiable clientele and a personal service.